Kareem Brewton,Jr., center, of Memphis is mobbed by teammates after his 3-pointer with .7 of a second gave Memphis a 73-72 lead over Temple in overtime at the Liacouras Center on the campus of Temple University on Jan 13, 2018. Memphis went on to win 75-72. 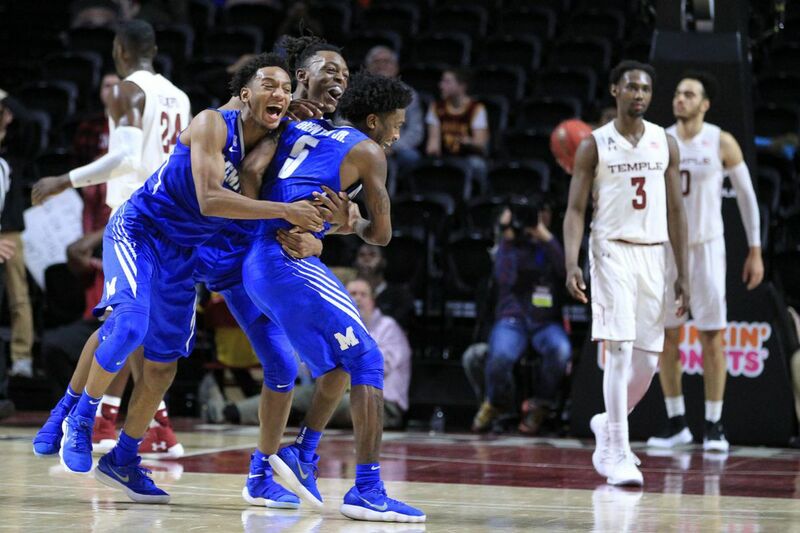 Temple found itself on the wrong end of a last-second shot Saturday for the second time in 10 days, this time a three-point basket by Memphis' Kareem Brewton with 0.7 seconds left in overtime that carried the Tigers to a 75-72 victory at the Liacouras Center. But there was so much the Owls could have done in the first 4 minutes, 59.3 seconds of the extra period that would have made Brewton's shot irrelevant and given them back-to-back wins for the first time in five weeks. Kareem Brewton,Jr., left, of Memphis shoots a 3-pointer over Josh Brown of Temple with .7 seconds to give Memphis a 73-72 lead over Temple in overtime at the Liacouras Center on the campus of Temple University on Jan 13, 2018. Memphis went on to win 75-72. How about two earlier second-chance baskets by the Tigers – by Mike Parks and Jeremiah Martin, the latter with 27.6 seconds left that made it a two-point game? Or the missed front end of a one-and-one with 25 seconds remaining by Temple's Alani Moore, who was shooting 71.4 percent from the line? Or yet another second-shot opportunity that set up the winning basket after the rebound of Martin's miss went off Josh Brown and out of bounds with 9.9 seconds left? "Then we do a good job on the out-of-bounds play," Temple coach Fran Dunphy said. "We block probably a pass – I can't exactly remember what it was – and the ball popped right back to Brewton. If Josh probably stays away from him, he shoots it differently, but he contested it and Brewton lofted it with the right arc and dead in the hoop. Just a killer." The Owls (8-9, 1-5 AAC) tried a desperation pass after the big shot, but Brown threw it out of bounds, and Jimario Rivers capped the game with two free throws. Brewton, who was just 8 of 40 on three-point attempts this season before his game-winner, joins the cast of those who provided forgettable moments for Temple fans. Cincinnati's Jacob Evans drained a jumper with 0.4 seconds left to send the Owls to a 55-53 loss on Jan. 4. "We can't keep letting games come down to the last couple of shots," said Shizz Alston, who had 17 points and seven assists. "We've got to start putting teams away. It doesn't come down to one play, but there's a couple of plays where we could have affected this game so it wouldn't have to come down to that shot." Nate Pierre-Louis of Temple celebrates after a steal and a breakaway dunk against Memphis in the 2nd half at the Liacouras Center on the campus of Temple University on Jan 13, 2018. The dramatic loss overshadowed a fine performance from freshman Nate Pierre-Louis, who led Temple with a career-high 23 points, including nine straight at a key juncture in the second half, and six more on a pair of overtime threes, the second giving his team a 72-68 lead with 46.9 seconds to play. Pierre-Louis started in place of Quinton Rose, the Owls' leading scorer entering the game with a 15.1-point average. Dunphy said Rose was benched for the first eight minutes for being late to the morning shootaround. Rose later sat out the entire overtime. "He didn't play great," the coach said. "I thought we were better served with the other guys in the game." Josh Brown of Temple stares upward after Kareem Brewton,Jr., (not pictured), of Memphis hit a 3-pointer with .7 seconds over Brown to give Memphis a 73-72 lead over Temple in overtime at the Liacouras Center on the campus of Temple University on Jan 13, 2018. Memphis went on to win 75-72.